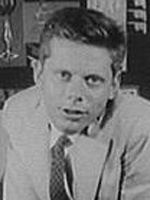 Robert Morse made his stage debut in the 1949 production of On the Town. He has a recurring role on Mad Men. Robert Alan Morse (born May 18, 1931) is an American actor and singer, best known as the star of both the 1961 original Broadway production and 1967 film adaptation of How to Succeed in Business Without Really Trying, and as Bertram Cooper, from 2007 to 2015, in the AMC dramatic series Mad Men Morse has earned multiple nominations and wins for Tony, Drama Desk and Emmy awards over a period of five decades. He is well known for his appearances in musicals and plays on Broadway, as well as roles in movies and television shows. Morse has appeared in dozens of TV shows going back to the live days of television with the Kraft Theatre and General Electric Theatre. Morse joined other performers, including Marlo Thomas, in creating the 1972 Free to Be... You and Me children's album. He also provided the voice for the cartoon character Howler in Hanna Barbera's Pound Puppies. Another famous role he played was Jack in the 1979 animated Rankin/Bass special Jack Frost. In The First Easter Rabbit, also by Rankin/Bass, he was the voice of the main character, Stuffy. He appeared as Boss Hogg's devious nephew, Dewey Hogg, on The Dukes of Hazzard (1984). He had featured roles in the 1993 miniseries Wild Palms and the 2000 medical drama City of Angels.